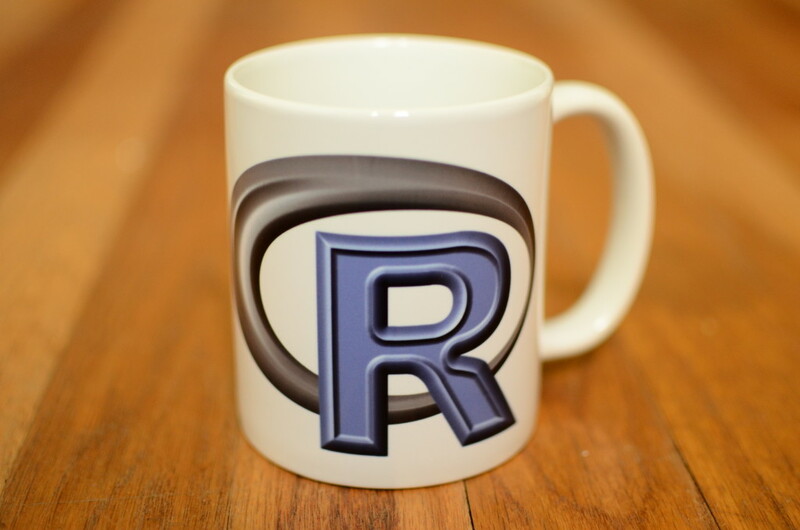 Looking for a mug with the R programming logo? I created a mug with the R programming logo for a friend and colleague’s going away gift but after it was delivered I realized I wanted one too. I may also order a few to give away at the R Meetup I organize. I think other R programmers might want one so I’m making it available to everyone here. Both new R logo mugs and old R logo mugs are available. Get your R mug and other R logo items at http://www.cafepress.com/rprogrammingnet. The R mug is good quality with a detailed R logo printed on one side. It’s available in white in a normal (called “small” by cafepress) 11 oz. size and a mega 20 oz. size. The normal size is also available in a color-changing finish that changes from black to white when hot liquid is added. Use the color-changing mug with your vintage Hypercolor t shirt and bring back the 90s! Stainless steel water bottles and travel mugs with the R logo are also available. If you get one, tweet a picture of your R programming mug in use to @RProgramming! I’ve also got R t shirts and R decals (great for laptops) for sale at http://www.cafepress.com/rprogrammingnet. Let me know if there’s another item you’d like. I just posted a mug with the new logo to Cafepress. See links above. Thanks!